The simple elegance of hard-working productivity. Unmistakeable, unparalleled style. The Lamborghini Trend family combined the brand's innate style with state of the art technology, superlative efficiency and extraordinary reliability. The superior productivity of the new, fuel-sipping 3 and 4 cylinder FARMotion engines is complemented to perfection by the new layout of the driver zone and many other new features. Compliant with the latest European regulations, these machines make no compromises where safety is concerned. Why just work when can work with style? The sinuous forms of the Lamborghini family style lend RF Trend tractors a sense of unique elegance that makes a clear impression when you're working in the vineyard or fruit orchard. The FARMotion Stage III B engine is a powerplant with class-beating characteristics designed and built specifically for agricultural applications. All versions, from the 3 cylinder 70 and 80 to the 4 cylinder 80.4, are turbo-intercooled and feature electronically controlled common rail fuel injection with injection pressures up to 2000 Bar. Compliance with Stage III B emissions regulations is achieved with a lightweight external cooled EGR system combined with a simple, maintenance-free DOC catalytic converter that does not require regeneration cycles performed by injecting additional fuel into the system. The results are astonishing performance and even better fuel economy than before. Efficient, simple to use and totally configurable: the defining traits of the transmissions equipping RF Trend tractors. Lamborghini RF Trend tractors are equipped with essentially all-mechanical, fully synchronised transmissions, making them extremely simple to use, efficient and reliable. The extensive choice of configurations offered includes transmissions based on 4 or 5 speed gearboxes with 2 or 3 ranges, which may also be combined with creeper and underdrive gears, to offer from 8+8 to 30+15 speeds in total. 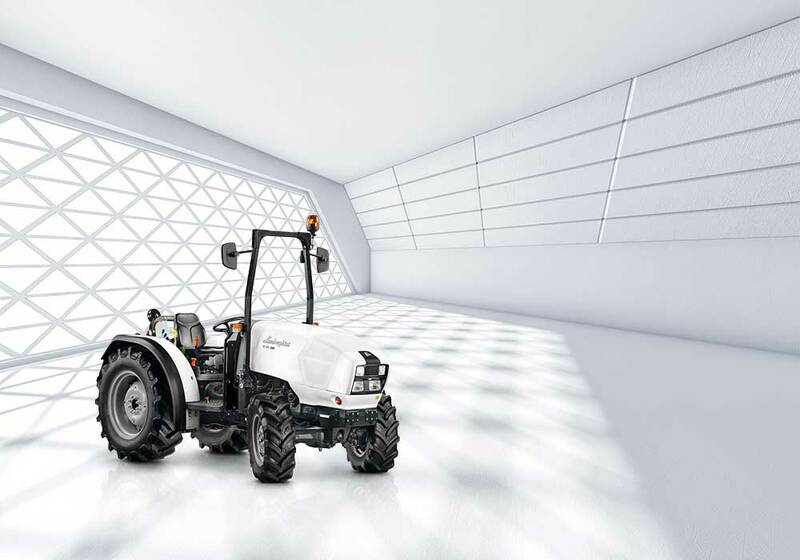 Whatever the configuration chosen, all transmissions allow the tractor to comfortably reach a top speed of 40 km/h, for more practical usage for transport tasks and driving on public roads. Simple, potent, efficient and configurable to suit your precise needs. An 18 l/min pump delivers oil exclusively to the hydraulic steering system, for impeccably smooth steering even at the lowest engine speeds. The lift and (4 or 6 way) distributors are fed by a separate, dedicated pump with a delivery rate of 42 l/min (or, as an option, 50 l/min). The 3-point rear linkage is available as either a standard version or a compact version, which minimises the space needed to manoeuvre at the end of the row. With a smaller centre tunnel and an all-new layout, the cab offers even more comfort than ever. For unparalleled simplicity, the driver zone features the tried and tested colour-coded control scheme, with controls organised in a functional, ergonomic layout around the driver, making them immediately and intuitively identifiable with no guesswork. Solutions that take the stress out of your daily work.